DER TESTWELL CTC++ FILM: Wie wichtig ist korrekter Software-Code? Testwell CTC++ ist das führende Code-Coverage-Tool zur Messung der Testabdeckung auf dem Host und auf allen (selbst kleinsten) embedded Targets. Das Tool kann in sicherheitskritischen Projekten genutzt werden, die beispielsweise nach DO-178C, ISO 26262, IEC 60880, IEC 61508 oder EN 50128 zertifiziert werden müssen. Hunderte von Firmen und Institutionen in über 30 Ländern nutzen Testwell CTC++ erfolgreich. Erfahren Sie im Video warum Testwell CTC++ die beste Wahl zur Messung der Testabdeckung ist. Testwell CTC++ is the leading Code Coveage Analyser : checks for all coverage levels, works with all compilers and supports all embedded targets and microcontrollers. 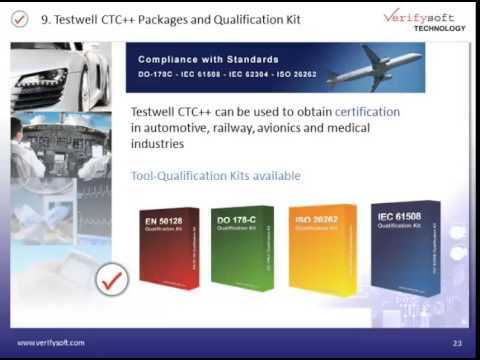 Testwell CTC++ is your best choice for safety critical development. Testwell CTC++ is the leading Code Coverage Analyser. 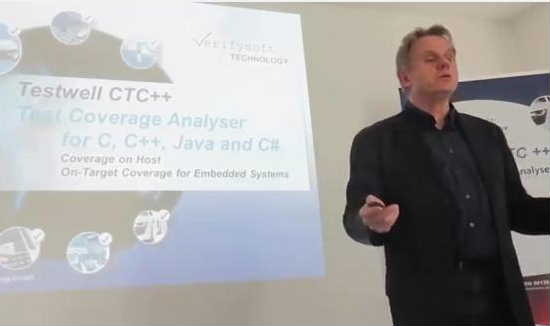 Verifysoft-CEO Klaus Lambertz shows in this 7 minutes video why Testwell CTC++ is the preferred Coverage Tool for hundreds of companies: support of all coverage levels, all compilers, and all embedded targets. Testwell CTC++ is the leading Code Coverage Analyzer for both host and on-target testing. This video gives a short introduction into the usage of the tool. Erfahren Sie in diesem Video mehr über Dynamische Codeanalyse und warum Code Coverage sinnvoll ist. Dr. Sabine Poehler (Verifysoft) erläutert u.a. 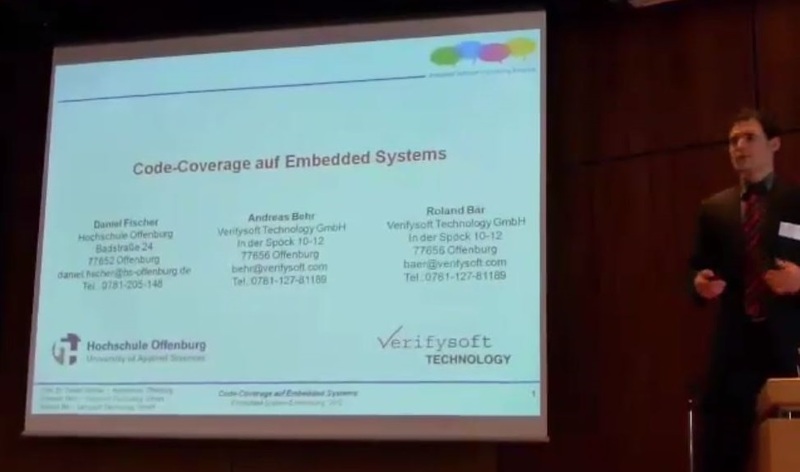 verschiedene Testabdeckungsstufen wie Function Coverage, Statement Coverage, Decision Coverage, Path Coverage, Condition Coverage, Multicondition Coverage und MC/DC Coverage. 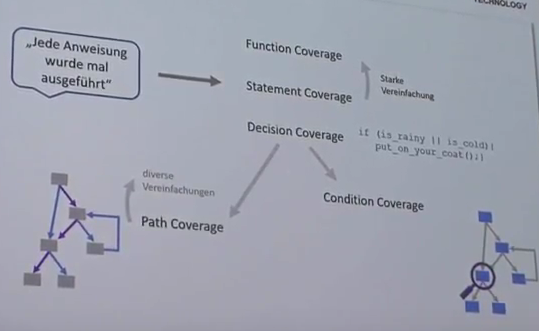 In diesem Video zeigen wir Grundlagen der Test- und Code-Coverage. 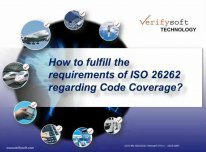 Neben Test- und Coveragestufen werden die Anforderungen der Sicherheitsnormen wie ISO 26262 oder DO-178C an die Code-Coverage angesprochen. Diese Präsentation beschreibt die Code Instrumentierung sowie Lösungen für Herausforderungen bei kleinen embedded Targets, die durch erhöhten RAM- und ROM-Bedarf sowie begrenzte CPU-Zeit entstehen. Embedded Office: "Mit Testwell CTC++ testen wir unsere Software garantiert so wie wir möchten"
Embedded Office, Spezialist für sicherheitskritische Embedded Software, nutzt Testwell CTC++ seit 2010. Geschäftsführer Michael Hillmann erklärt, warum er mit Testwell CTC++, der Firma Verifysoft und deren Support sehr zufrieden ist. "Testwell CTC++ ist ein Gewinn für die Firma Embedded Office". Schleißheimer ist Spezialist für die Entwicklung von Soft- und Hardware für Microcontroller und Real-Time-Systeme für wichtige Automobilzulieferer. 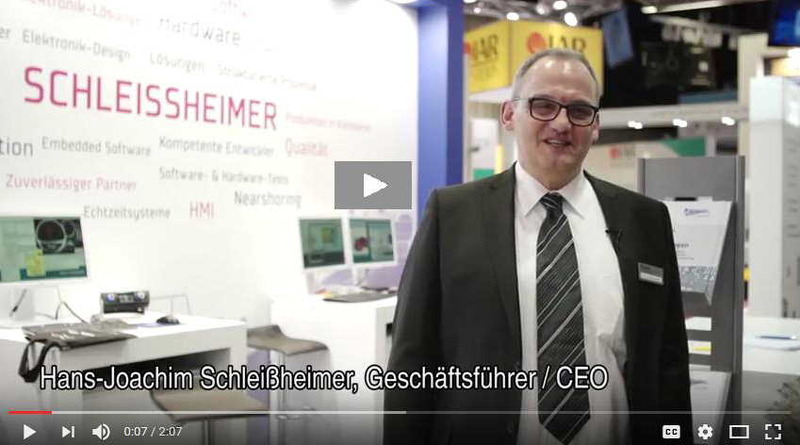 Firmenchef Hans-Joachim Schleißheimer erklärt im Video warum Testwell CTC++ ein strategisches Tool zur Bewertung der Testqualität ist. Bei Schleißheimer wird Testwell CTC++ seit 2007 in der Entwicklungskette an allen Stellen zwischen Entwicklung und Test eingesetzt. In einem Interview der ELEKTRONIK PRAXIS / Vogel Business Media spricht Klaus Lambertz über den Einsatz von Code Coverage und Statischen Codeanalysetools in sicherheitskritischen Projekten. Errors in embedded software can be life-threatening. With no margin for errors, it is critical that your software development adopts a rigorous approach to compliance. For this reason, this paper presents an approach for supporting Code Coverage on embedded targets, and more specially targets with restricted resources (ROM and RAM) where code instrumentation techniques used to measure coverage might lead to a real challenge. In order to understand why this could be a challenge, we’ll review key information about Safety Standards and the related coverage levels that they recommend. We will also briefly introduce tool qualification towards certification of the embedded software for which code coverage has been measured. 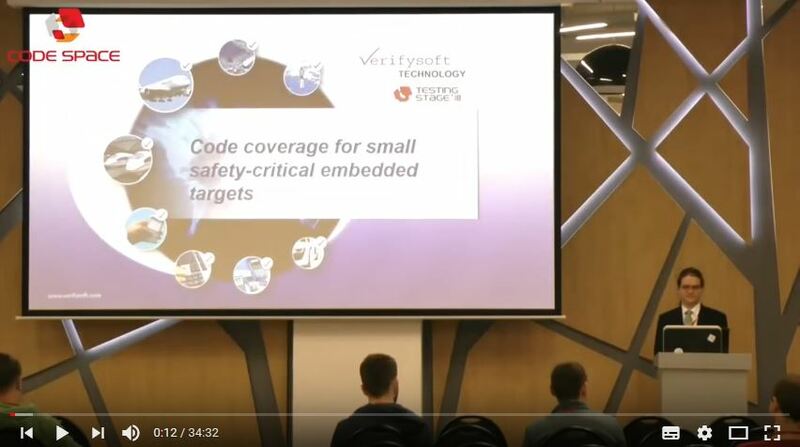 This recorded webinar shows how to analyze Code Coverage on any embedded target with Testwell CTC++, one of the leading coveage tools. Testwell CTC++ is compliant to safety standards like DO178-C, EN 50128, IEC 61508, IEC 62304, ISO 26262, and others. The tool works with all compilers and all (even very small) embedded targets and microcontrollers. 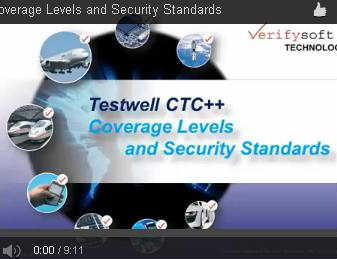 In this Video for Testwell CTC++ users, we will show how to do code coverage on embedded targets. As an example we will use atmega328p (part of the Arduino REV3-board). The top benefit of Testwell CTC++ Test Coverage Analyser is running code coverage analysis on any target, even with targets with very low RAM & ROM resources, no filesystem and limited hardware channel for communication. 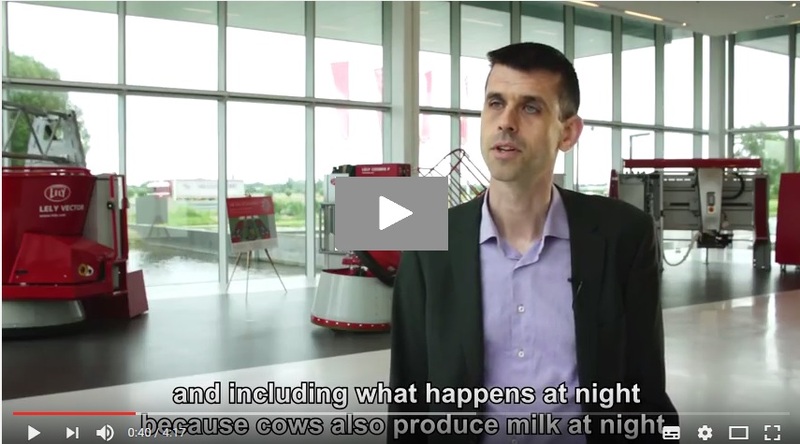 This video demonstrates key features and benefits of Testwell CTC++. The demo is based on an Atmel ATmega 328p μController, an 8bit cost effective chip. -sending CTC_array content to the serial line (USART), a console in our case formatted with the Intel HEX format (note: this 2nd scenario with Testwell CTC++´s bitcov add-on is way to go when having trouble with Hota setup and no debugger connected. 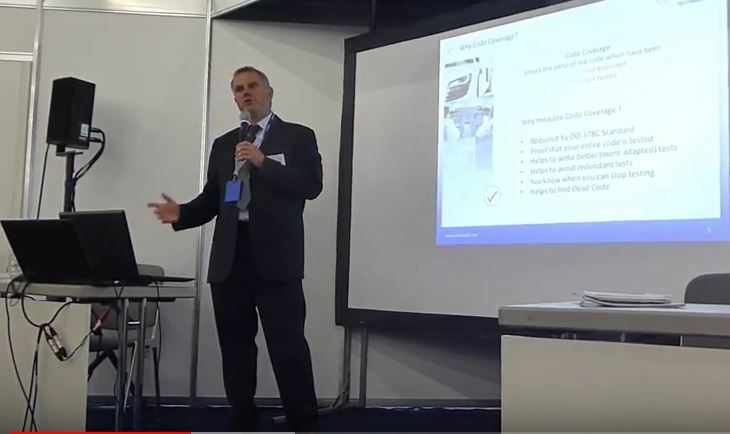 This presentation has been held at Embedded Confernece Scandinavia in Stockholm (November 2015). Olivier Casse (Verifysoft France) shows which code coverage levels are required by saftety standards and how to achieve them with Testwell CTC++. 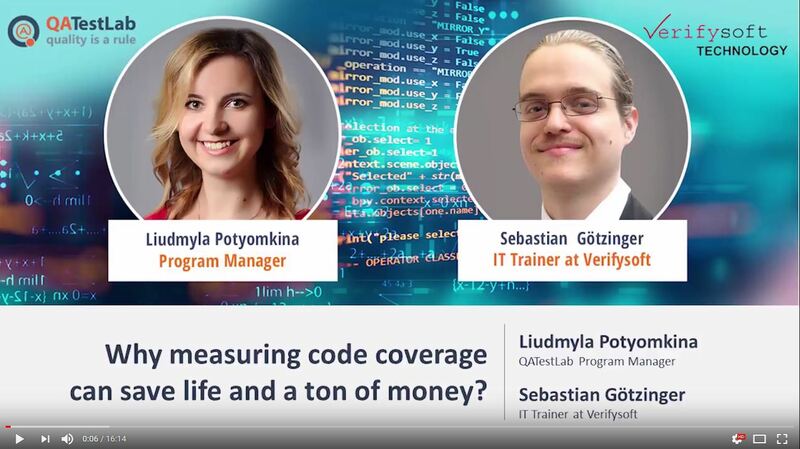 This presentation shows what code coverage is and why it should be measured. Different coverage levels are shown and requirements of safety standards (IEC 61508, ISO 26262, DO178-C, ...) are discussed. You will also get a short look into Testwell CTC++, a leading Test Coverage Analyser. 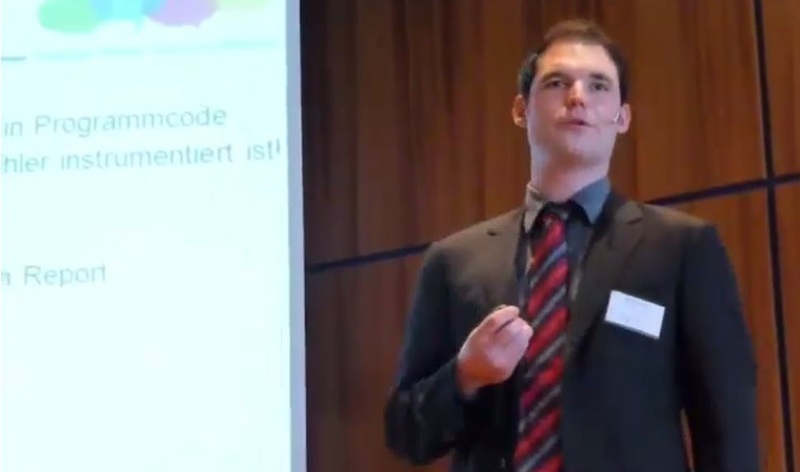 Dr. Oscar Slotosch, Vorstand der Münchener Validas AG, spricht in diesem Video über das Tool-Qualification Kit für Testwell CTC++. 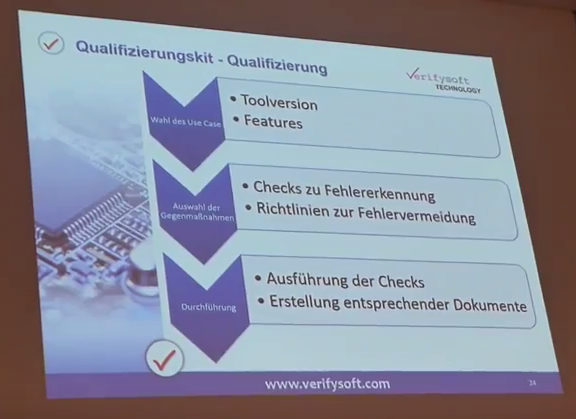 Der Kit unterstützt Firmen beim Qualifizierungs- und Zertifizierungsprozess von sicherheitskritischer Software, die nach den Normen DO-178C, ISO 26262, IEC 61508, EN-50128 und IEC 60880 entwicklet wird. Der Kit enthält über 50.000 Testfälle und generiert automatisch die für die Zertifizierung erforlderlichen Dokumente. 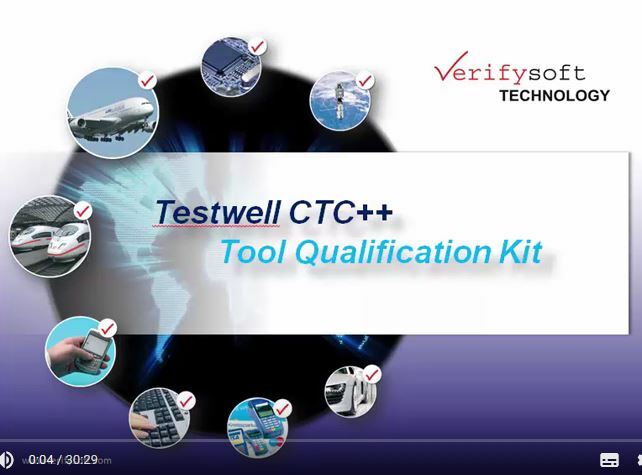 This video is a recorded web presentation by Dr. Oscar Slotosch, Validas AG (Munich, Germany) about Tool Qualification and the Tool Qualification Kit for Testwell CTC++. The standard DO-178C "Software Considerations in Airborne Systems and Equipment Certification" is the commonly used standard for software in the avionics industry. It requires Code Coverage Analysis up to MC/DC coverage for the highest safety level DAL A. 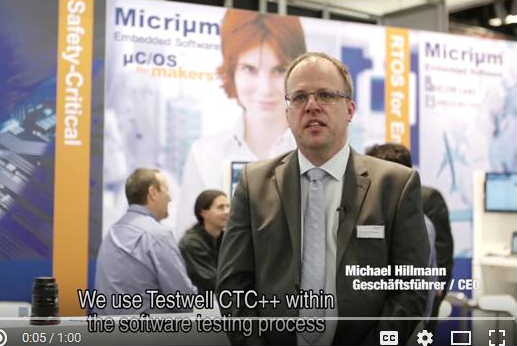 Watch how to be conform to DO178-C requirements with Testwell CTC++ Test Coverage Analyser. Warum Testtools qualifizieren und nicht zertifizieren? Softwaretoolhersteller bieten für ihre Werkzeuge, die in sicherheitskritischen Projekten wie zum Beispiel der ISO 26262 zum Einsatz kommen, Zertifikate und/oder Qualifizierungs-Kits an. In unserem Video erklärt Sebastian Götzinger die Begriffe Tool-Klassifizierung, Qualifizierung und Zertifizierung und grenzt diese zueinander ab. Der Original-Vortrag wurde im Juli 2017 beim Münchner Forum Safety & Security gezeigt, dieses Video zeigt die wesentlichen Inhalte im Zusammenschnitt. 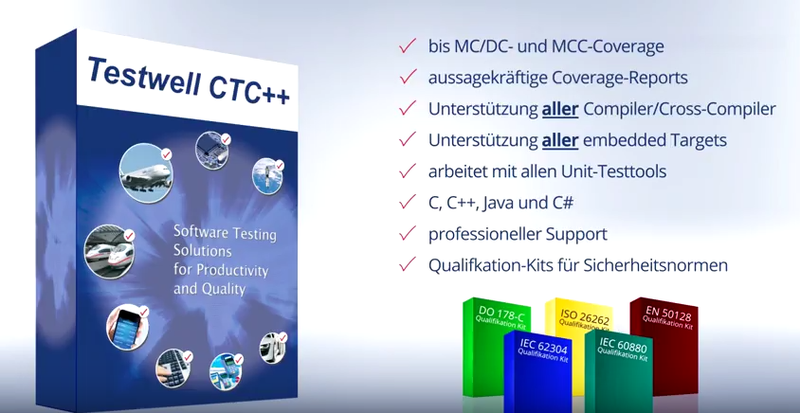 Testwell CTC++ kann mit allen Compilern und Cross-Compilern und ist in zahlreiche Entwicklungsumgebungen und Werkzeugketten integriert. Die hier gezeigten Videos stellen lediglich eine Auswahl der durch Testwell CTC++ unterstützten Umgebungen dar. Testwell CTC++ is a leading tool for measuring Code Coverage on host and on any embedded target. Testwell CTC++ can be integrated into many IDEs. 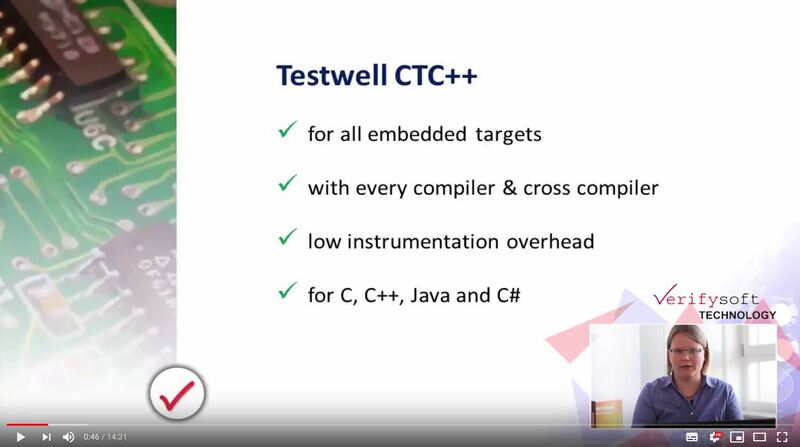 This video shows how to integrate Testwell CTC++ into YOUR IDE. We used Code::Blocks as example. For integrations into Microsoft Visual Studio and IAR Workbench, please refer to our special videos. Testwell CTC++ is a Test Coverage Analyzer which measures the Code Coverage of your software. 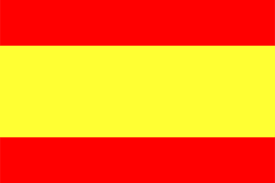 The tool supports all compilers and all embedded targets. Testwell CTC++ is integrated in many IDEs. 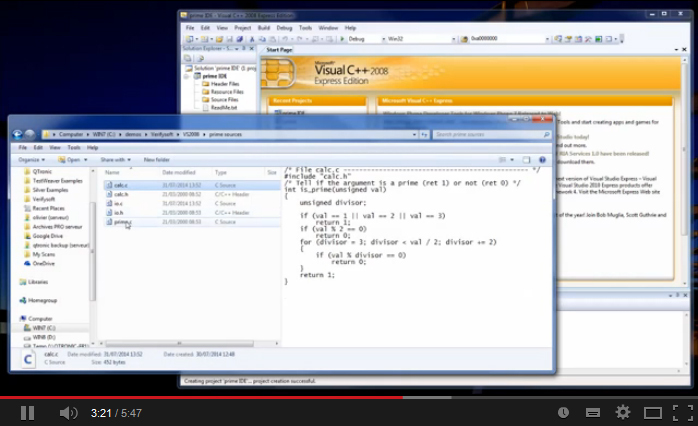 This video shows the integration of Testwell CTC++ in the Eclipse IDE. 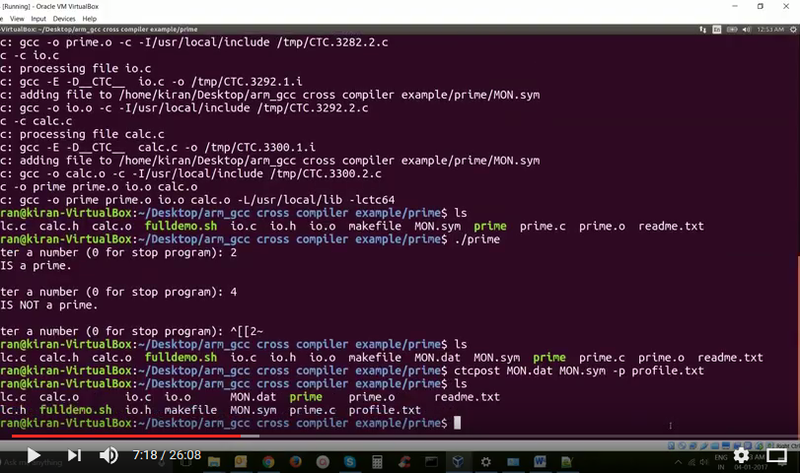 The video shows also how to install Testwell CTC++ for Linux. 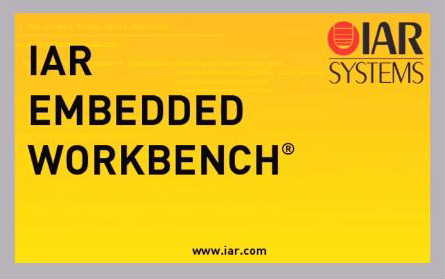 This video describes the usage of Testwell CTC++ Test Coverage Analyser with IAR Embedded Workbench IDE. Testwell CTC++ is a leading tool for analysing Test Coverage. 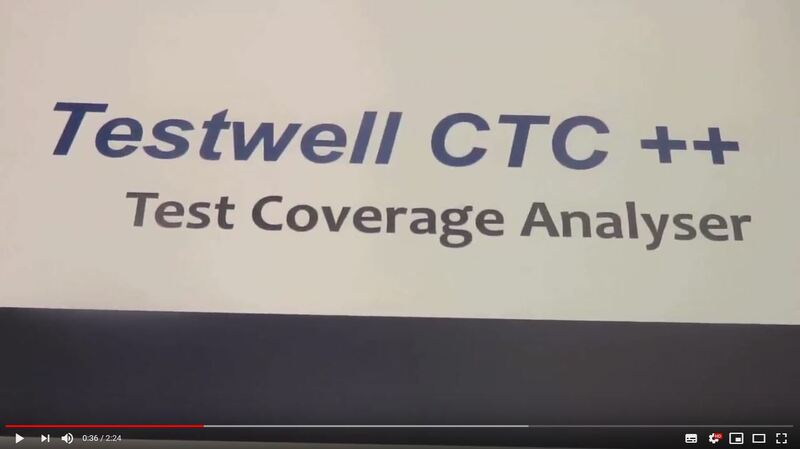 In this video we provide a complete Proof Of Concept demo on how to collect coverage data with Testwell CTC++ in MATLAB Simulink from The Mathworks. The example is based on code generated out of Simulink and compiled/linked with Microsoft Visual Studio compiler, instrumented for code coverage analysis by Testwell CTC++ running on Windows. The top benefit of Testwell CTC++ Test Coverage Analyser is running code coverage analysis on any target, even with targets with very low RAM & ROM resources, no file-system and limited hardware channel for communication. This video demonstrates key features and benefits of Testwell CTC++. The demo shows the process commonly used for integrating Testwell CTC++ within a micro-controller compiler/linker, driven by Microchip MPLAB IDE. You will see an easy way of getting coverage data collected on the target, AKA saving/dumping CTC_array content on the host drive from the debugger. This demo shows how to convert the exported data, which is a proprietary ASCII format, to binary format, compatible with the Testwell CTC ++ report generator. Testwell CTC++ can be easily integrated in Visual Studio 2008 IDE. The following tutorial demonstrates the integration of Testwell CTC++. Complete demo on how to collect coverage data with Testwell CTC++ Test Coverage Analyser using Bitcov add-on setup in Trace32 debugger tool from Lauterbach.The example is based on a GNU gcc compiler for ARM running on Windows10.An application note fully describing step by step the example project is available on request (please contact us). This video demonstrates key features and benefits of Testwell CTC++. The demo shows the process commonly used for integrating Testwell CTC++ within an IDE and the setup of the compiler driven by this IDE.You will see an easy way of getting coverage data collected on the target, AKA saving/dumping CTC_array content on the host drive from the debugger.This demo shows how to integrate scripts for setting coverage analysis ON & OFF, cleaning intermediate files, and finally generating the coverage report. Overall this is an example of completing your current tool-chain with test coverage features.